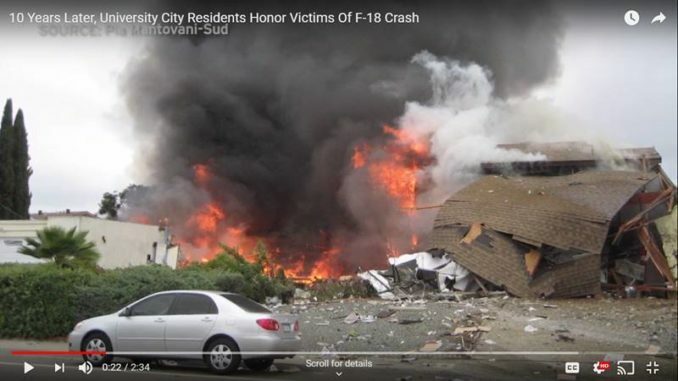 Ten years ago a Marine F-18 crashed into a University City neighborhood. KPBS Military Reporter Steve Walsh had this look back at some of the lessons learned. Ten years later, University City residents honor victims of F-18 crash at a Memorial and Tree Dedication. Neighbors will gather at University Village Park, 7100 Florey Street (at the corner of Gullstrand/Cather and Florey) in University City, on December 8 at 11:30 AM, for an hour of remembrance and healing: to share experiences, for a moment of silence and to dedicate four trees planted as a living memorial to those who lost their lives. Set your alarm to ring or your calendar to ping at 11:58 AM on December 8 to mark the time of the crash and to observe a moment of silence.